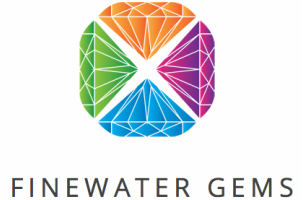 Please examine the gemstone galleries for the complete selection of Finewater Gems currently offered for sale. All attempts have been made to photograph and describe the gemstones as closely as possible, but saturation and colors may be displayed differently on your monitor. Please keep in mind that no one can properly critique a gemstone by analyzing a photo, and no photo can replicate the experience of viewing a gemstone in your hand and in your lighting. Light and dark areas that might be visible in a static photo are necessary to provide contrast and scintillation to the gemstone when it moves, and slight inclusions or color zoning that are sometimes seen in my highly magnified photos will not be noticeable at normal viewing distances. In the event of any perceived discrepancy between the photos and the written description, the written description takes precedent. Geographic origin shown in each gemstone listing is based upon the best information available, but it is not guaranteed. IF - Internally Flawless. Free of inclusions under 10X magnification, or "loupe-clean". VVS - Very, Very Slightly Included. Extremely small inclusions difficult to find using 10X magnification. VS - Very Slightly Included. Small inclusions noticeable under 10x magnification. Difficulty in seeing inclusions at a normal viewing distance of 18-24 inches with the unaided eye. Very limited impact on face-up appearance of the gemstone, and commonly referred to as "eye-clean". SI - Slightly Included. Small inclusions noticeable with the unaided eye at a normal viewing distance of 18-24 inches. Limited effect on the face-up appearance of the gemstone. MI - Moderately Included. Inclusions are visible to the unaided eye at a normal viewing distance of 18-24 inches. Some impact on the face-up appearance of the gemstone. Finewater uses PayPal as our payment processor but a PayPal account is not required. During the checkout process you will be taken to a PayPal page where you have the option to use either your PayPal funds or a credit card. If you would rather pay with a check or bank transfer, please contact us for instructions. Billing and shipping addresses must be identical, and there is no cost for shipping and insurance to addresses within the United States. If you reside outside the United States, additional international shipping and insurance charges will be automatically applied on checkout, but costs for import duties, taxes, fees, and any other associated costs are the responsibility of the customer. Please contact us if you have questions about shipping or if you should experience any issues with the checkout process. Your satisfaction is guaranteed. If you are unhappy with your gemstone for any reason, please return it within seven days of delivery in its original undamaged condition and with all original gem packaging and applicable ID reports for a full refund of the purchase price (except for sale items identified as "no returns"). International shipping and insurance charges are not refundable. Secure and timely return shipping with full insurance is the sole responsibility of the customer. You must contact us before shipping in order to receive return authorization and shipping instructions. All sales are considered final after the seven day evaluation period.